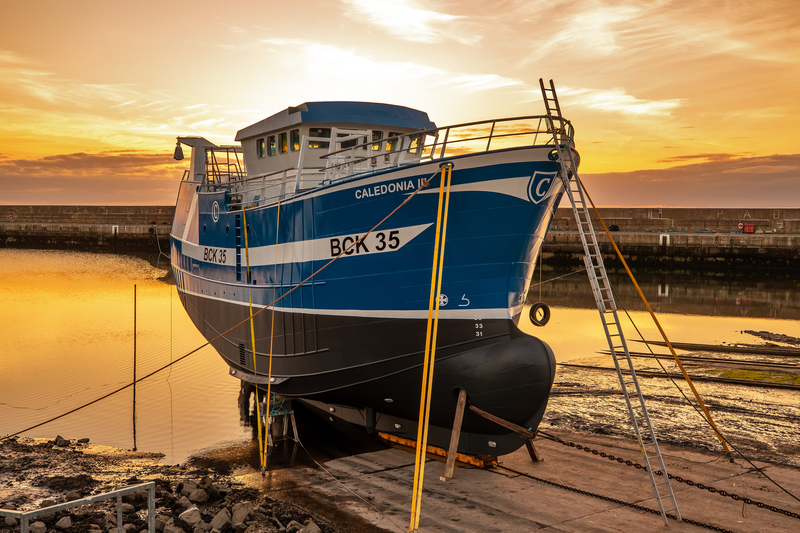 Steven Clark launched the Caledonia III in the early hours of Thursday morning as part of a £2 million investment with local firm Macduff Shipyards. The 46-year-old spent most of yesterday at Buckie Harbour to see the boat take to the water and last night said he had finally achieved a life-long ambition. “It’s something I’ve always wanted to do,” he said. I’ve been at the fishing for 30 years and you always dream of having your own boat. The Caledonia III at its launching at Buckie Harbour. “Then when you get it, you strive towards building your own boat. We’ve done that now. It is hoped the Caledonia, which was preceded in name by Mr Clark and his father’s boat the Caledonia II and his father’s first boat, the Caledonia, will set sail for Scrabster in the summer to begin fishing the west coast. Registered to Buckie, it bears the number BCK 35. It has a full-time crew of eight, including Mr Clark’s son-in-law. Mr Clark said: “There’s a better outlook in the harbour these days. “People are talking about it and even last night there was people coming over and saying ‘well done’. “When I first started fishing here the harbour was full and things were booming, but within eight years it had died a death. “So it’s fine to see things moving again and with Macduff Shipyards coming in I think we’ll see this place busy for most the year. Macduff Shipywards bought over Buckie’s shipyward last summer. At the time, the firm’s managing director, John Watt, said he saw “great potential” in the port. It also has bases in Macduff and Fraserburgh.